Titer tests are blood tests that your veterinarian can do in the hospital or send to a lab that check for antibodies from previous vaccinations. Essentially, positive titer test results mean that your dog still has enough antibodies -- from previous vaccinations -- to protect him or her from diseases like distemper or parvovirus. More and more dog people use titer testing to AVOID OVER-VACCINATING their dogs ... because if your dog still has protection, then there is NO NEED to revaccinate. Unfortunately, NO STATES recognize RABIES TITERS instead of revaccination of dogs, so unless your state allows medical exemptions and a dog qualifies for a medical exemption, then by law, you do have to vaccinate dogs for rabies. In many states, that's now required every 3 years instead of every year. I sincerely hope that the Rabies Challenge Fund is able to prove that rabies vaccinations could be done every 5 years or even every 7 years so that states might change their requirements. Don't be thrown by references to "1-year" or "3-year" rabies vaccines. It's the SAME vaccine. Get the one labeled as "3-year," though, so that your state won't require you to vaccinate more often than that. When Lilly suffered a deadly adverse vaccine reaction to a routine rabies vaccination in January 2012, people rushed to make me the anti-vaccination "face" in the dog world. So, I am NOT against vaccines. I am, however, opposed to OVER-vaccination of pets. Having had a dog die from a vaccine, I'm probably far more sensitive to this issue than others might be. Titer testing (also called antibody testing) is done by diluting the test sample again and again, using a base factor of 2, until a titer cannot be measured (example ... 2, 4, 8, 16, 32, etc). I'm writing this because MOST of the discussions you'll find about titer testing will tell you that ANY level of measurable TITERS means revaccination is not necessary. Nonetheless, I think it's important to talk about the numbers and what the lab itself says about them. Some less expensive titer tests ONLY tell you if a titer is detected at all, not the actual ratio. The tests that I've had done so far do give me the full results, which are represented as a ratio -- 1:2, 1:4, 1:16, etc. Recently, I paid $288.50 to have Clover's distemper and parvo titers tested. According to the lab paperwork I received, here are the numbers you WANT to see. Anything between 1:16 to 1:32 is better. Anything over 1:64 is best. Anything over 1:2 is fine. Anything between 1:2 to 1:16 is better. Anything over 1:32 is best. 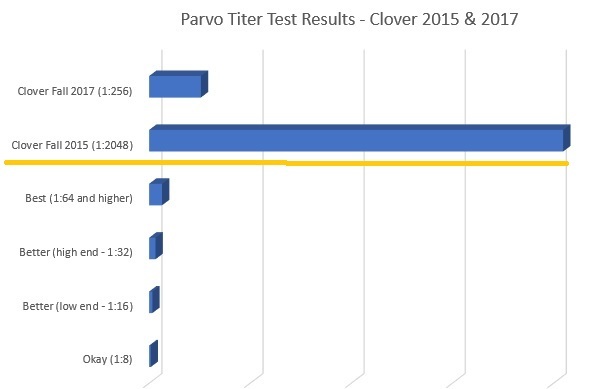 Let's look at Clover's titer test results for Distemper and Parvovirus as a case study. 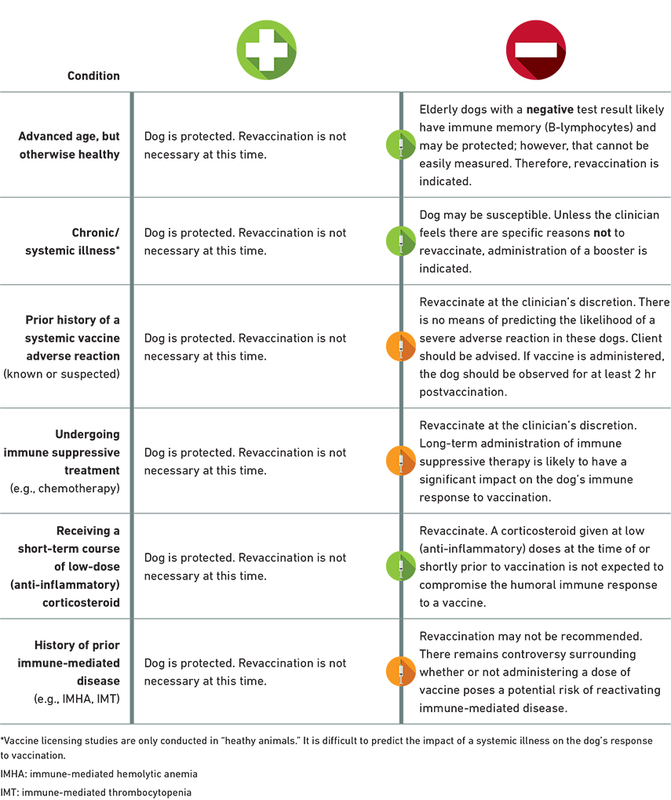 Technically, by the guidelines, a dog would be due again for the combo vaccine every 3 years. So, that's when I had Clover's titers tested again -- 3 years after vaccination (even though it was only 2 years between titer testing). 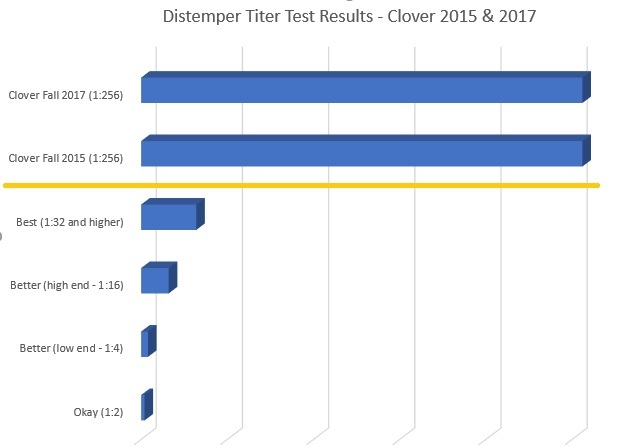 Clover’s distemper titers are exactly the same as in 2015 (a year after she finished her puppy shots), which is great. Notice that I inserted the levels the lab paperwork say are protective below the orange line, for comparison. IS THIS NORMAL? I tried and FAILED to get other examples to see what kinds of titer drops other people may have seen, so I cannot tell you if a drop like this is common. IS THE TEST DIFFERENT? I checked to see *if* the titer TEST itself has changed between 2015 and 2017. It has NOT. WAS THERE A GLITCH? I also wonder if it might be a sample or test glitch. We won't know if that's the case until we test Clover again. For example, if her values GO UP next time, then we'll be more confident saying there was some sort of anomaly with the 2017 test results. Either way, my veterinarian wants to recheck Clover's titers in 1 year, rather than wait 3 years. So, we'll see how things look in the fall 2018, and I'll report back. Do you feel comfortable saying that ANY TITER means your dog does NOT need to be re-vaccinated? Or if test results dropped below "okay" or "fine" levels, would you revaccinate? Titer Testing and Revaccination - What Do the AAHA Vaccination Guidelines Say? Also look at the drop-down content details #2. I think the decision charts for dogs with health issues are super important, this includes dogs going through cancer treatments, those with chronic illness, and even those with immune-mediated diseases. Personally, I would quibble with the recommendation to consider revaccinating dogs with a known history of adverse vaccine reactions that don't pass a titer test because we did everything we could to protect Lilly after she had minor vaccine reactions, and ultimately a vaccine still killed her. NOTE: This chart is used here with the written consent of AAHA. "Interestingly, recent practitioner surveys indicate that 'owner request' is the most common reason for performing antibody testing in practice." In other words, it's consumers DRIVING the rise in use of titer testing in dogs. Had Lilly survived her adverse rabies vaccine reaction for long enough to be "due" for revaccination we would NOT have done it. We would have gotten her a medical waiver for rabies, and she NEVER would have been vaccinated for anything ever again. 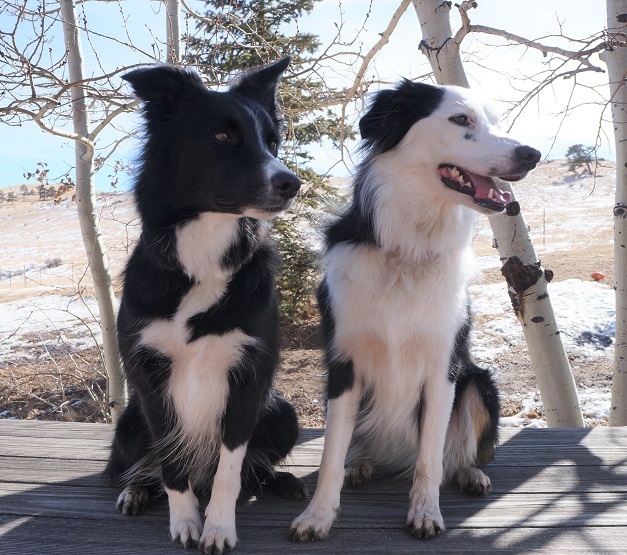 If you want to read more about a real-life example where a family will be in a position to make revaccination decisions in the wake of a dog being diagnosed with an immune-mediated disease, I recommend checking out Fidose Of Reality, where Dexter was diagnosed with immune-mediated thrombocytopenia. The post includes a video Q&A. As Always ... Talk to Your Veterinarian About All This! So, I'm sharing our experiences and these titer testing details because I think it's important, and I hope it's helpful to you. However, you need to make decisions for YOUR DOGS in collaboration with YOUR VETERINARIAN. You may run into a problem if you want to use dog daycare or a boarding kennel. I'm in the process now of trying to find a good boarding option for Clover and Tori. Some kennels I've contacted WILL NOT accept titers as proof of disease protection. Others will. I'm planning to visit in person the ones I've found that do accept titer testing for parvo and distemper. All of them also require the kennel cough vaccine, but I'm okay with that since I would only need to give it before we had a trip planned and not on a routine basis. The other option, of course, is to have a pet sitter come into your home. That's NOT an option for us for a number of reasons, but that may be a good way for you to get around the titer versus vaccination issue. I'm happy to hear about your experiences with titer testing for dogs. Pop me a note or post a comment. Thanks! Thanks for writing about this Roxanne. Very well written. I asked my Veterinarian if I could send Quinn’s blood to Hemopet (Dr Dodds’ lab) for parvo and distemper titer testing. The cost for both is $52. $20 for heartworm. Now I was at the office for his annual check-up so she didn’t charge me extra for the blood draw. I had to complete the form that is on Hemopet’s website, pay before I sent it, and take the parcel to the post office to be mailed 2 day priority but it was a lot cheaper than IDEXX, the lab she uses. Hemopet provides instructions to the veterinary staff on what viles to use, etc. I just had to point them to the information on the website. The results were simple, over 1:80 for parvo, over 1:16 distemper. Enough for my purposes. I haven’t had mine titer tested for rabies yet but most likely will when they’re due again. They are on the 3 year vaccine though so I think I still have one more year. Nevertheless I will be paying up to $200.00 per dog (unless they’ve gone up or down on rates) but I certainly don’t want any reactions. Strangely enough I think this is very close to abuse (not by the Vet because they are mandated to do the vaccine) by the states. What is going to end up happening is people will not vaccinate their pets and they will by-pass the titers test also due to the expense. So animals that may need it will be unprotected. I’m just concerned that this has more to do with money and politics rather than the actual health of the animal. After all the AKC actually believes that puppy mill owners are legitimate, licensed breeders. “Proponents make inflammatory allegations about abuses by breeders (whom they call “puppy mills”), and offer a solution that ironically, bans the most regulated and vetted sources (including breeders and handlers subject to federal licensing) while urging the sales or adoption of animals obtained from sources that have little or no regulatory oversight and that are not subject to federal oversight, state consumer protection laws or other guarantees.” This is directly from an article on their website. But it’s the same with the veterinary medicine manufacturers. I’m certain they lobby and make donations to people who will support their point of view. I have to stop now because politics does nothing but anger me. Thank you for a very informative article Roxanne. I will most likely refer back to it. I would like to see titers become the norm instead of vaccines. People aren’t re-vaccinated every 3 years, why do we do it to a dog that may live up to 15 or 20 years? Plus, I would like to see the costs come down as titer testing becomes more widely used. Absolutely agree, Edie. I’ve heard others paying about $60 for the simple yes / no titer tests, but I’m paying a LOT more than that for the tests I have done. It even took a little extra time to do the blood draw because the techs had to call the lab and find out what they really needed to run the test. So, that makes me think NOT many people at the veterinary clinic I use are asking for titer testing, even though it’s been a real thing for quite a while now. One of the boarding kennels I called yesterday had NO IDEA what I was talking about when I asked if they accepted titer testing. And, another one, owned by a veterinary hospital was VERY SNIPPY with me when I called to ask. But, I think when organizations like AAHA are including details on how to use titer testing, then individual veterinarians need to STOP acting like people like me are anti-vaccination crazies.